My daughter has her own Wordpress.com blog where she posts articles about whatever she finds interesting. A few days back, she asked me if she could have a ISP-hosted WordPress blog, as she now wants have more control over things like themes and plugins etc. Before investing any money into it, I wanted to see just how much interest is there really. As I have a couple of Synology boxes, I thought maybe she should start with a WordPress blog on one of them and practice. If everything works out well, moving the content to another site is not a problem anyway. With that in mind, I installed WordPress on one of my Synology boxes. It’s not rocket science but still, here is a quick post about the steps involved in case you want to do it. 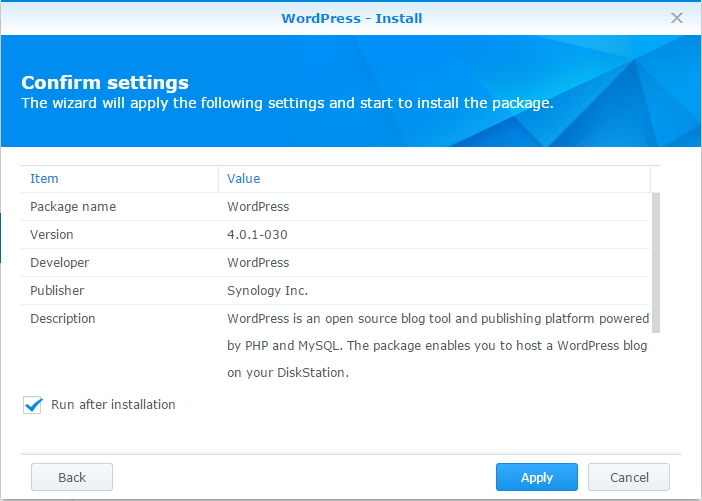 There are a couple of prerequisites before you install WordPress on a Synology so let’s go through those first, otherwise it just gets annoying. 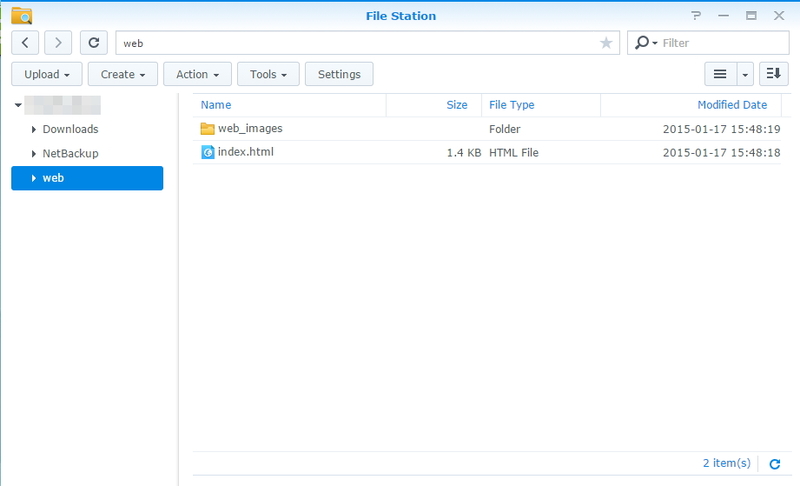 If you don’t already have “Web Station” enabled, you need to enable that first. Go to “Main Menu” and click on “Web Station”. Once that’s enabled, go to “Control Panel”, then to the “Web Services” utility and “Enable Web Station” by ticking the box next to it. Click “Apply” to apply the configuration. Review other options but they’re not required for this installation. Next step is to install “MariaDB”, the next prerequisite. Go to “Package Center” again and search for “MariaDB”. 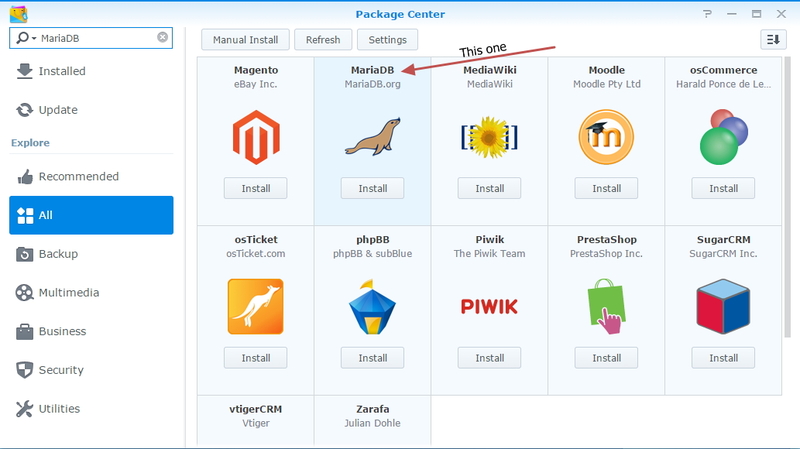 A number of packages come up but click on “Install” for MariaDB. If all is well, it should install silently. Now we’re ready to install WordPress. 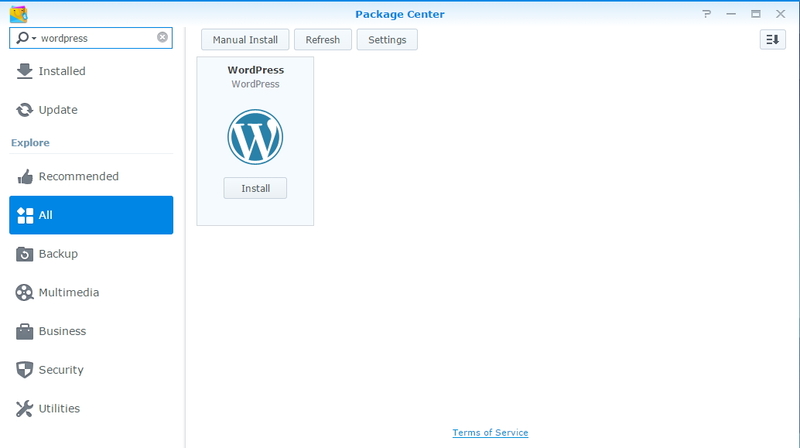 Go to “Package Center” again and this time, search for “WordPress” and once it shows, click on the “Install” button. The next screen shows up which requires you to enter your MySQL password. Now if you have changed the default MySQL password on your Synology, enter that password. Otherwise, unfortunately, it’s blank. Click “Next” to continue. The confirmation screen comes up. Click “Apply” to install WordPress. Initial configuration is pretty straight-forward so I won’t go into that but it’s that famous “five minute installation” that WordPress has. Just choose the right language for yourself, site name, user name and password and you’re done! Thank you very much for that guide and it helped a lot. I am having one question though. What am i doing wrong if when i do the Step to open and the famous install should start i only get a blank space? The Url will be looking like this http:///wordpress instead of what you described. Hope you have an input on how to fix this. http:///wordpress should be the site address, which will be blank initially as no configuration has been done yet. That’s why, initially you have to go through that simple install screen on http:///wordpress/wp-admin/install.php You’ll know if you have or haven’t done that step already as if you have, then it’ll tell you so. Otherwise, the configuration screens come up. After those initial questions, it’ll prepare the site for you and then the address above should work. I was looking for help to see the website online and came across your post. I already have made my website with wordpress, but not sure which url to provide my friends so they can see it. It doesn’t work. what could be wrong? do i need to follow extra steps to see it online? Your blog is good. I am sure it’s going to help many beginners like me.Thank you in advance. It seems that you’re trying to give your friends access to your wordpress installation but your Synology website is behind your router and the firewall on it is preventing it from being accessed. If so, there are some additional steps you will have to do. Firstly, you’ll need to setup something called a “Port Forwarding” rule in your router. Every router is different so you might need to consult its documentation see how it’s done, although, it’s not that difficult if your router has the capability. What we’re talking about is to redirect your friends’ “web” traffic to your Synology box (you already know the IP address of it). Once that’s set up, you need to tell your friends the “external” IP address of your connection i.e. the one visible to the outside world. Your router should be able to tell your this in its connection settings. Again, the documentation should help you with that. Ather, great you did that. It helps better than the stuff Synology is providing. Thank you very much! I installed wordpress successfully, but when I start it for the first time via http:///wordpress, it redirects me to DMS admin login page https://:5000. So I can’t setup wordpress. Any ideas why this happens? 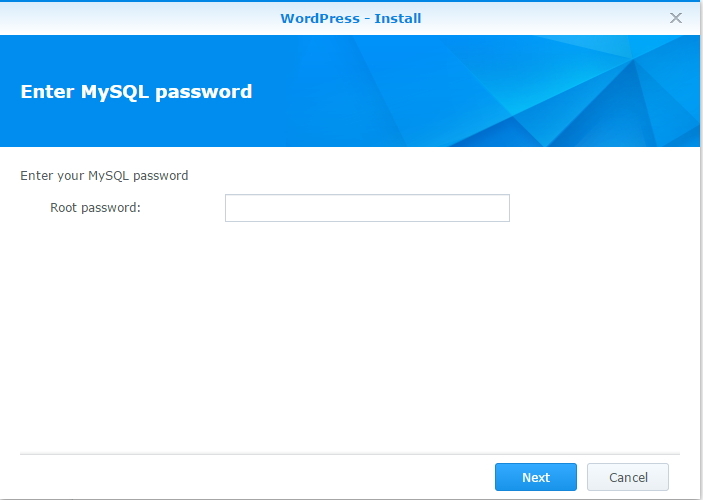 I installed wordpress successfully, but when I start it for the first time via http://synology-ip/wordpress, it redirects me to DMS page again https://synology-ip:5000. So I can’t setup wordpress. Any ideas why this happens? The only reason I can think of is if the installation is corrupt in some way and the browser is not able to get to index.php in the “wordpress” folder. If it can’t find the file it’s looking for then I believe the browser is redirected to the DSM login page. Check if you have a folder \web\wordpress and an index.php inside. If they’re there, then look for other missing files or remove the package, check it’s completely gone and try again. Thanks for your reply. I checked the \web\wordpress folder and everything seems to be there. There is an index.php. I do have an index.html in my \web root folder though, so I don’t understand the redirec to DSM. Could be that somewhere an error occurs and it redirects to DSM in this case as you mentioned. hi friend thank you for the article I have a question how to change http://synology ip address/wordpress/ to my domain? can you please explain me ? I have a similar issue as Archana has stated before. 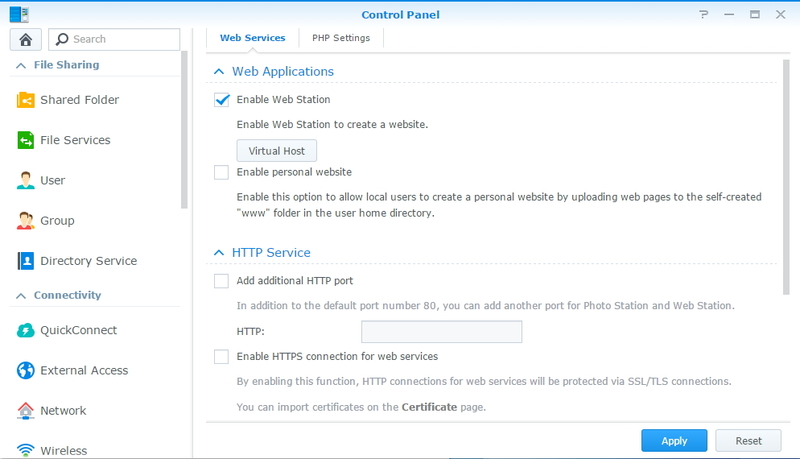 I have set up all requirements to run WordPress on my Synology (MariaDB, PHPmyadmin, Port forwarding etc.). However I don’t know how to create a valid URL/Domain like “example.com”, which I can forward to my friends. Yet, I just have access to my WordPress via local network by using 192.168.x.x/wordpress. It either does not sounds good and it gives not a permission to open it from outside the network. Well, it is pointess if WordPress only exists in my own network. How can I fix this problem? Do I need a external Domain name from a host? If,yes how can I connect it to my Synology? The goal is to be able to spread my WordPress to the world of internet. Hi, If you haven’t yet solved the external access problem, you might be interested in my blog at http://synologywordpress.blogspot.co.uk/ where I go into the details of how I sorted out my external access.